LONDON, England (CNN) -- A Russian billionaire and former KGB agent is buying a controlling stake in the venerable Evening Standard, the London newspaper announced Wednesday. The Evening Standard was sold for the token sum of £1. Alexander Lebedev, 49, already owns the independent Russian newspaper Novaya Gazeta, one of the few pro-democracy newspapers in Russia. Lebedev is buying the Evening Standard for £1, or $1.38, a spokesman for the deal told CNN. While it sounds like a steal, the purchase price is more symbolic than reflective of the paper's worth. With it, Lebedev also assumes the unprofitable paper's debts. The Standard reported it is the first time a Russian business magnate and former member of a foreign intelligence service has owned a British title. Lebedev told The Guardian newspaper this month that he read the Evening Standard when he was a spy working at the Soviet Embassy in London in the late 1980s. "I had to read every newspaper," he told The Guardian. "I had to read the FT (Financial Times), The Guardian, Standard, and the Daily Mail." 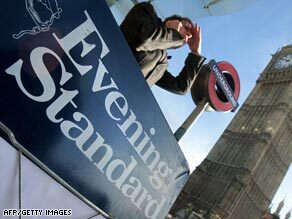 Lebedev said the Standard was "a very good newspaper" with some "brilliant journalists." The oligarch said he had no intention of interfering in British politics and vowed a hands-off approach, telling The Guardian, "My influence would be next to zero." Top management of Daily Mail and General Trust (DMGT), which is selling its controlling interest to Lebedev, said the move ensures continued investment in the 182-year-old paper. "We believe that the agreement announced today is in the best interests of the staff and our shareholders," said Martin Morgan, chief executive of DMGT. "The investment planned by Mr. Lebedev secures the future of the paper." Lebedev owns 49 percent of Novaya Gazeta together with former Russian President Mikhail Gorbachev. A journalist from the newspaper was killed Monday in Moscow when she tried to intervene in the fatal shooting of a Russian human rights lawyer, Russian media reported. In addition to owning Novaya Gazeta, Lebedev is also chairman of the board of the National Reserve Corporation, which is the majority shareholder in National Reserve Bank, one of Russia's largest. Lebedev also owns 30 percent of Russian airline Aeroflot and shares in finance and energy companies, including Russian energy giant Gazprom. After serving in the Russian parliament, the Duma, Lebedev formed a new political party last September. The Independent Democratic Party of Russia campaigns for legal and economic reform, a stronger role for parliament, and the expansion of Russia's independent media. Lebedev is purchasing the Evening Standard with his son, Evgeny, 28. "The Lebedev family is delighted to be investing in the Evening Standard," Lebedev said in a statement. "We are strong supporters of a free and independent press and we greatly admire the Evening Standard as an iconic publication with its pedigree of fine journalism and commentary." Evgeny Lebedev already has hefty business dealings in London and elsewhere in Europe. He owns stakes in several London restaurants, he runs a men's fashion company that has shows at Paris Men's Fashion Week, and he has interests in hotels in Italy, France, and Switzerland. Forbes Magazine listed Alexander Lebedev as the world's 358th-richest person last year, worth $3.1 billion. Forbes said Lebedev made most of his money through investments in banking and insurance companies and in Aeroflot.